Is It Good? Dept. H #1 Review – AiPT! Matt and Sharlene Kindt build a mystery in the deep of the ocean as the titular Dept. H must reckon with a loss of one of their own. Is it good? Dept. H #1 revolves around Mia, a young woman who descends to an underwater base where she is to investigate the death of her father. Matt Kindt serves as writer and artist, while Sharlene Kindt utilizes watercolors to bring the book to life. 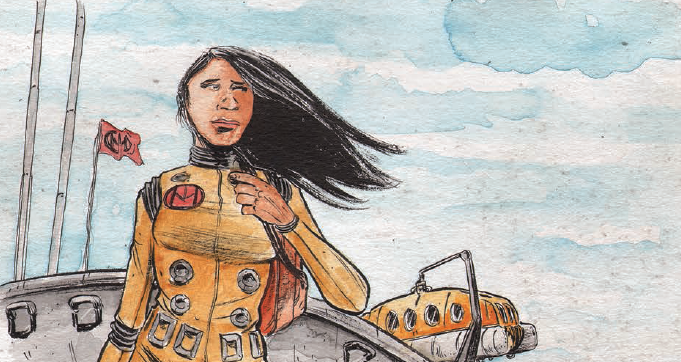 Mia makes for an engaging protagonist, as Matt Kindt’s writing allows readers into her mind, revealing her fears and anxiety about the situation. The captions emphasize the claustrophobic setting in a natural way and help to build tension as she descends deeper to the Dept. H base. Mia isn’t the only character that makes an impression however, as Q, the head of security, jumps off the page with his accented speech pattern and straightforward personality. Kindt also provides a private moment between Mia and her brother, Raj, and the distance at which they interact speaks volumes about their relationship. That being said, not all of the characters get their due introduction. Several only get a line of dialogue, and while that helps show how they are prioritized in Mia’s head, it feels odd to have members of a relatively small cast seem like extras. A quick caption beyond their name might have given the characters a chance to make a better impression. In addition to the script, Matt Kindt also handles the artwork in Dept. H #1. His lines have a rough quality to them, but his art is incredibly detailed, creating a world that feels rugged and harsh. The specificity of his artwork also lends itself to the mystery, as certain objects seem to catch Mia’s eye as she searches the crime scene while others are conveyed to the reader only in the wider shots. Kindt’s figures have stylistically exaggerated features, but it never becomes distracting. Within this looser style, Kindt is able to convey a lot of emotion, such as when Mia says goodbye to Alain. It’s a beautifully tender moment, and Kindt uses the space between the panels to illustrate their love. While Matt Kindt’s rough linework evokes a sense of tension, it’s Sharlene Kindt’s colors that really create the atmosphere to the books. The use of watercolor for a deep sea adventure is a clever touch as the medium’s inherent qualities create the sense of being in the ocean. The blues used in the flashback sequences have a murky quality to them which calls back to the setting of the book. The dark of the ocean is contrasted nicely with the oranges of the lighting. The orange hues add a rustic and dingy feeling to the interior scenes. Dept. H is a haunting debut that effectively sets up the whodunit mystery at the heart of the story. Both the writing and the artwork do an excellent job setting up the claustrophobic and dangerous environment that separates the title from so many other murder mysteries. Matt and Sharlene Kindt make for a great 1-2 punch, with good characters and art that is beautiful in its ability to create mood. Dept. H #1 is a must buy for fans of either science fiction or mystery.